Back in the late 90s, I was addicted to a computer game called Master of Orion. This turn based, sci-fi computer game leeched hours of my life as I tried to conquer the galaxy with my fledgling race. So it was with no small bit of excitement that I jumped at a chance to play a card game based on one of my favorite computer games. The oddly named Master of Orion: The Board Game is actually a card game set in the Master of Orion universe. 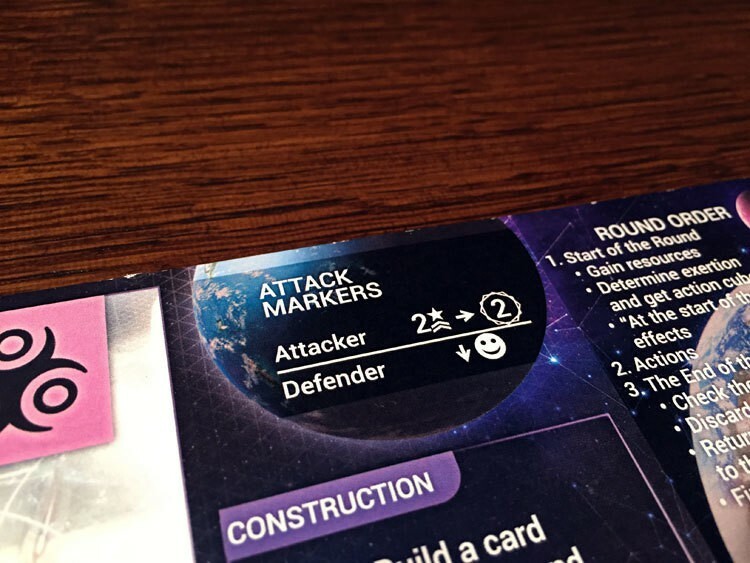 With multi-use cards, easy to learn rules, and some minor asymmetrical race powers, Master of Orion checks a lot of boxes for me. 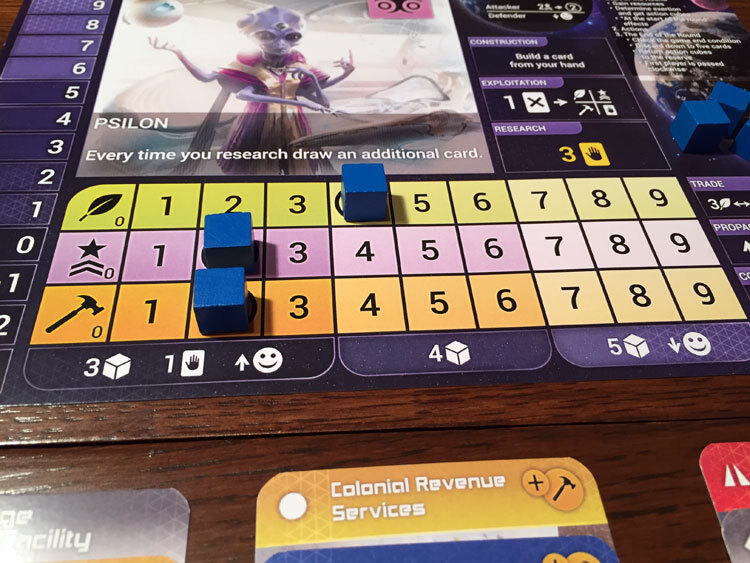 Master of Orion: The Board Game isn’t due out until next year, but we were given a prototype copy to check out. Players will use their available action cubes to take each action. Overall, I’d say that Master of Orion is a medium-weight game. Each player starts out as either the human race, or a unique race from the Master of Orion universe. Humans will have no special abilities, while the other races each have minor differences/abilities. The game is played out over the course 8 or less rounds. Each round has players taking actions, one at a time, until everyone is out of action cubes. The amount of action cubes a player gets on their turn is based on the amount of their highest resource level. There is a sliding scale where players with low resources will gain cards and loyalty, but less actions. Build: Pay a resource cost and play a card into one of your 4 “systems”. Each card will grant a player a special ability and also produce resources each round. 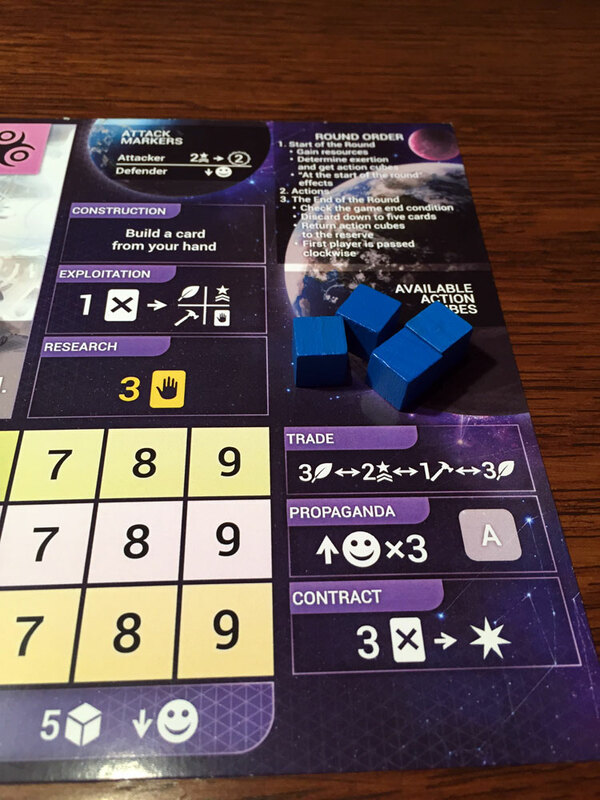 As more buildings are constructed, players will lose the special ability of the previously played card in that system, but still maintain the cards resource production. Each System can hold up to 5 cards, with the top most card being the active one. Exploit: Discard card a card to gain the resources shown on the bottom of the card. Trade: Trade one resource for another at a specific ratio. Active a card: Some cards in your systems will be use activated. Make a deal: Discard 3 cards to hire one of the advisors from the center of the table. The game comes with 8 advisors, and 5 will be used in the game. Players can only have one advisor at a time. The defender will lose loyalty and you gain victory points at the cost of some fleet points. Each player can only be attacked once or twice a round, depending on the player count. At the end of the round is a cleanup phase and then the next round begins. The game can end in one of three ways: One player is eliminated (Loyalty below zero), one player has built 20 cards, or at the end of the 8th round. The player with the most victory points wins. Each “system” can hold up to 5 cards. 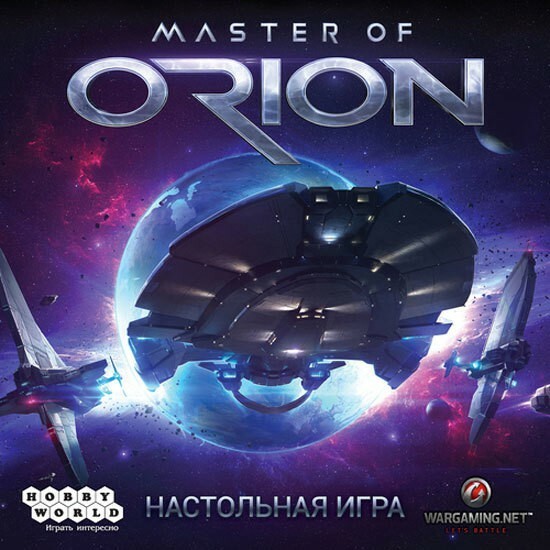 As I said earlier, I was a huge fan of the Master of Orion video game so I really wanted Master of Orion: The Board Game to be good. And overall, I think publisher Hobbyworld did a fine job with this game. While it’s not going to pull in back into a world of 90s nostalgia as you relive the glory of the Psilon race, It was actually much better than I expected it to be. I always have a bit of trepidation with licensed games, as sometimes they will rely too much on love of the source material as a crutch, but thankfully, that didn’t happen here. The top of each built card shows which resource (if any) it produces for your civilization. One of the things I liked the most about Master of Orion was all the different actions you can do on a turn. None of them are overly complicated, yet there still are a lot of ways for players to accomplish what they are trying to do. For example, if you need to draw more cards, you can take the research action, you can take the exploit action, or you might even have a building that gives you that power. I always enjoy when players aren’t shoe-horned down a specific path. When it comes to the races, most of the familiar Master of Orion races are represented here. And the aliens all have special powers that loosely tie back to the source material. For example, the Psilons, who were great at researching new technology in the video game, have a stronger version of the research action in the card game. That being said, I wasn’t a big fan of the human race in this game. They are very vanilla and have no special powers. It’s a fine option if you have a complex game, yet none of the racial powers here are all that game-breaking. So I’m not sure why you’d ever play as the human race in this game. I would have preferred Hobbyworld to give the humans their own unique spin as well. Attacking in Master of Orion isn’t very punishing. If there is one other thing Master of Orion could improve upon it’s the advisors. Some of them felt definitely better than others, and there are only 8 in the game. I would have liked to see more of them, especially to add some extra variety to the game. I think that could be an easy way to help player tailor their strategies. That being said, I did enjoy how there seems to be many paths to victory. 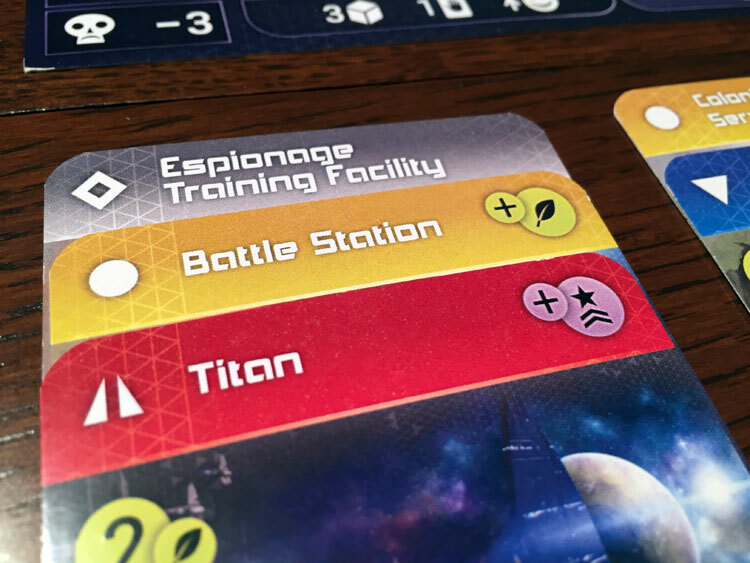 The building cards are split up between a few different types (War, Production, Etc…) which allows players to craft their strategy based on their particular play style. I’ve seen some players go heavy attacking, while others try and build the high VP producing buildings. Finally, I liked the way attacking was handled in this game. The attack action might scare people off of the game, especially those who don’t like a lot of confrontation in their euro games. However the attack action in Master of Orion is fairly benign. The losing player only loses a few points of loyalty, which is both easy to get back and rarely game breaking. The only time you have to worry about loyalty is if you are close to the elimination point. The more resources a player has, the more actions they gain in a round, but at the cost of loyalty. We were given a pre-production copy of Master of Orion from Hobby World and I really liked where they are going with this game. While I’d like to see a bit more variety in the game’s cards, overall I enjoyed it and would be happy to play it many more times. I always like multi-use cards in my games, and Master of Orion made good use of that mechanic here. As mentioned earlier, there are many paths to victory and even the 3 different ways that the game can end. 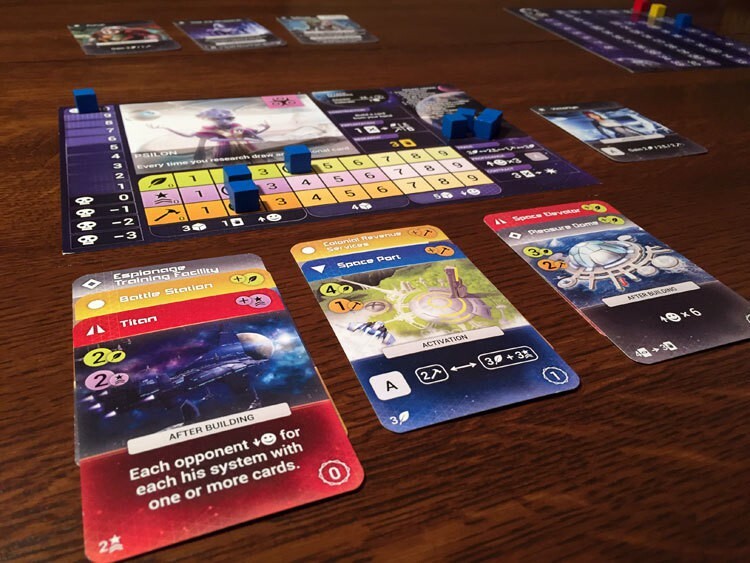 While the game is based on the old Master of Orion video game, you definitely don’t have to know anything about that game series to enjoy Master of Orion: The Board Game. The game is only loosely tied to the source material, yet it still makes for a great, medium-weight tableau builder. Keep an eye out for this one in 2017. Really looking forward to a chance at playing this.